1. I must be looking surprised. But I kind of can’t help it because I still think this is SO DAMNED COOL! Went out to archery this morning. The last round of shooting for the day is the balloon round, where they put a balloon with a dollar inside on each target. Everyone steps up to the line and we each get two arrows to try to hit the balloon. It’s a contest of both speed and accuracy. This is the first time I got the balloon. 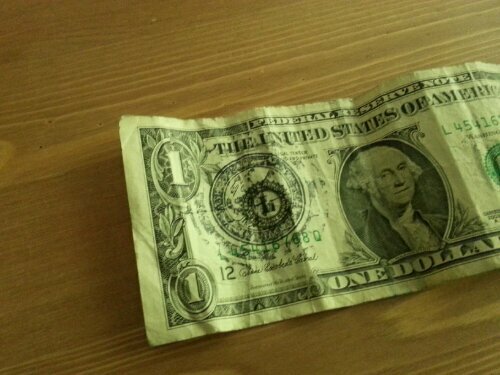 They stamp your dollar with a Pasadena Roving Archers stamp. Also, I hit the inner ring of the bullseye today. I’m shooting from 20 yards. 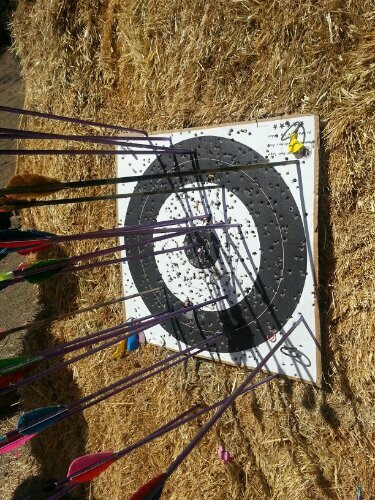 The only arrow in the center in this photo is mine. The fundamentals course is supposed to start mid-February and I should be acquiring my own equipment at the end of it.